This chapter analyses the discourse of globalisation from the perspective of Hong Kong following the change of sovereignty. The analysis shows how the post-handover government maintained the previous colonial policy of emphasis on free trade within the context of an authoritarian framework of government. The chapter does this through the analysis of a speech given by the chief executive of the SAR, Tung Chee-hwa (and thus links back with Chapter 8), in London in October 2000. The speech highlights the SAR government’s measures to address the challenges posed by globalisation and its ability in capitalising on the assumed benefits of the global phenomenon. The analysis demonstrates how globalisation is discursively constructed as immutable and that it is the role of the government to manage the changes that are made necessary by the new global economy. 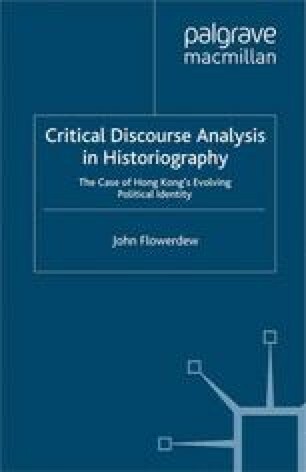 The chapter begins with a discussion of the notion of globalisation, then considers globalisation and Hong Kong, before presenting the detailed textual analysis. The latter demonstrates a range of discursive phenomena that realises the discursive construction of globalisation and the role of government as referred to above.